Welcome to winter! Model S & Model 3 Tesla in for Opti Coat Pro Plus Normal pigtails, scratches, and paint defects were prevalent despite being one of the easier colors to prepare via Paint Correction. As well one beautiful Porsche Cayman GT4 Red for Opti Coat Pro for proper protection for the long haul. Wheel faces, lenses, paint, and chrome were covered with one step Optimum Opti Coat Pro system. Opti Coat Procomes with a 5 year warranty (paint failure) along with hydrophobic, easy to clean, marring, scratch, and acid resistance. Model S Midnight Silver with full protective 3M Pro Series & Crystalline Films from Custom Tint Inc. Coated with Opti Coat Pro Plus! Porsche GT4 Opti Coat Pro! Thanks to all my clients and the support they give in trusting me with their vehicles. Just a quick video of various detailing from 2016. – inspect vehicle paint thickness, primarily the hood. Paint thickness ranges for vehicle from 100-120 microns. Hood had a high of 140 microns to 100 microns. We consulted with the client to ensure a 95% correction was achieved, as well as acknowledging remaining defects would have to be sanded to achieve perfection. Client approved of the approach. Polish:Meguiars Foam Cut Compound M101, 3d Car Care HD Polish, HD Adapt. Condition: Paint readings on all surfaces and overall impression was a definite need for paint enhancement. Paint was somewhat soft, hence the ability for a good finishing polish and proper buffing technique to eliminate a huge amount of swirls. Pictures were a bit lacking due to time and sun constraints. claybar windows and paint. Worst areas were on the wing and roof. 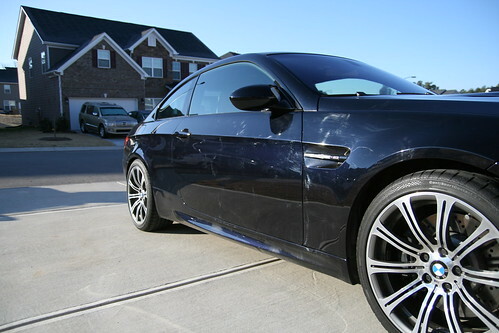 2008 Jerez Black M3 with dealer induced swirls. Thankfully only from the carwash and dealer neglect. Wash – Foam bath with Poorboy’s SSS, Power Clean – Pre Wash.
Clay – Yellow Erazer for decontamination. Polish/Compound – D300 Correction Compound & M105 with Cutting MF Pad, D300 with Finishing MF Pad. Finish – Optimum Poliseal, Optimum Optiseal, Optimum Car Wax. Finish Kare 425 Wipedown.